Old time service station turned brewpub, Angry Hanks is in very close proximity to the other brewpubs in town, making it very easy for a pubcrawl. With garage doors that open onto their wood-fenced patio, Angry Hanks has a unique service station ambience. Head brewer, Mohr worked at Red Lodge Ales for five years before moving to Billings and opening his own brewery. 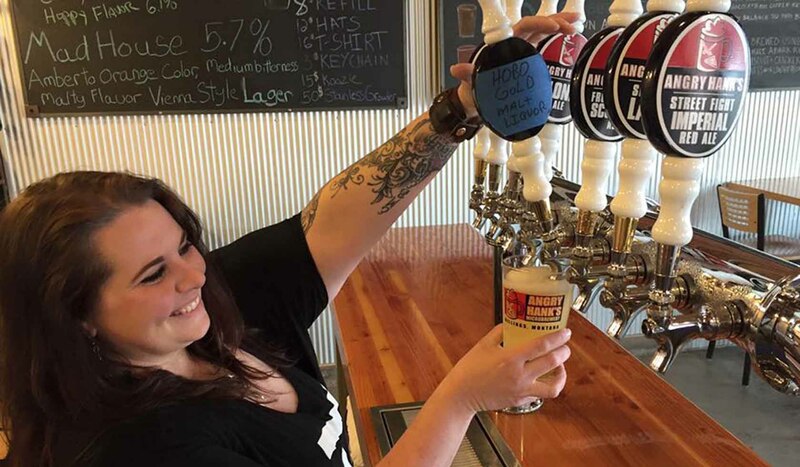 Providing outstanding selection and quality with 8 ales on tap including Anger Management Belgian-style Wheat, Angry Hank's Blonde, Street Fight Imperial Red, Dog Slobber Brown and Head Trauma IPA as well as seasonal beers. Angry Hanks is located at 2405 First Avenue North, in the brewery district in downtown Billings. Second location at 20 North 30th Street in Billings.Angry Hanks is located at 2405 First Avenue North, in the brewery district in downtown Billings. Second location at 20 North 30th Street in Billings.